COUPON ALERT: Through December 12, 2016 use the code GIFTBOOK on Amazon to save $5 on a $15 book purchase! I absolutely love Q&A, fill-in, journal type books. They are an easy way to do memory keeping, only require a few minutes and are so fun to look back on. I have bought several new ones for 2016 and thought I would share my favorites + some other ones that you might be interested in. Order a few on Amazon and have them in time to kick off 2016! One Line a Day: A Five-Year Memory Book : If you like the idea of daily documenting, this is the journal for you! Super simple design and easy way to do memory keeping. 1 Page at a Time: A Daily Creative Companion : This is a really fun concept, especially for creatives. Each of the 365 prompts in the book will encourage you to draw, write, list, reflect, and share. I think I am going to keep this at my office for when I need a creative break. Make It Happen! : A Workbook & Productivity Tracker for Getting Stuff Done : I’m in a big goal setting season, so am excited about this book. It arrived yesterday and I already love the clean design. 40 Days and 40 Nights: Taking Time Out for Self-Discovery : This might be cool for someone looking to do some inward soul searching and self-discovery. Listography Journal: Your Life in Lists : Lists are so fun and this Listography journal is full of great prompts. 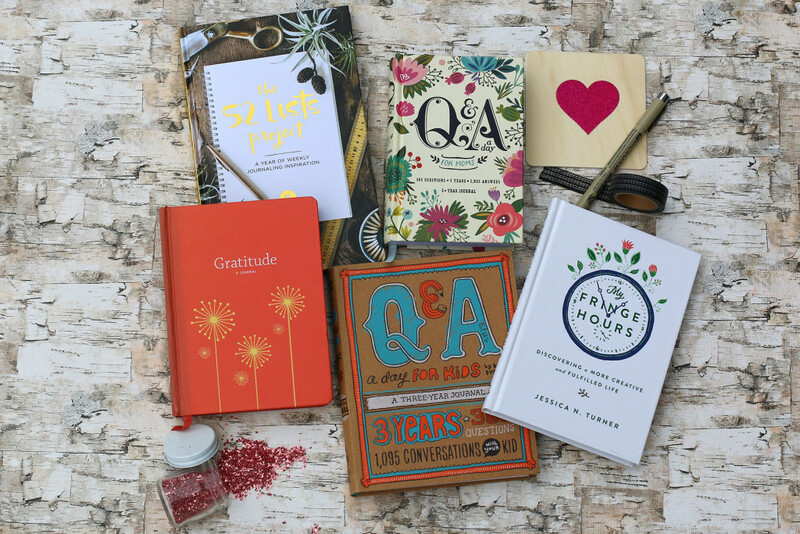 For Moms: Here are a few other books that you may enjoy if you like these types of journaling books. Parenthood Listography: My Kid in Lists: List lovers rejoice over this fun way to document stories and life with your child. So fun! Mom’s Five-Second Memory Journal: A Memento of Motherhood: This book is very compact and would be easy to store in a purse or car for when you just have a few seconds to write. When it is complete, it will be a treasure to pass on to your children. Letters to You: This gorgeous hardcover linen book offers yearly questions and prompts for a parent to write to their child. The design is classic and simple and would make a treasured keepsake. For Your Kids: The Q&A series also offers kid and teen versions. I have the kid ones for Elias and Adeline and ordered the teen ones for my nieces for Christmas. They are fantastic! Q&A a Day for Kids: A Three-Year Journal (pictured above): This could either be filled out by a parent or a child. It asks daily questions and offers space to write the answers for three consecutive years. It’s fun to see how your child changes through his/her answers. Check out this Facebook Live video I did where I shared many of these books. I love books like this! I’ve got both The Book of You and Live This Book to dive into!